BOSTON (Reuters) - U.S. Secretary of State John Kerry was slapped with a $50 fine for failing to have a side street adjoining his Boston home shoveled following the blizzard that dropped more than 2 feet (60 cm) of snow on Massachusetts this week, a spokesman said on Friday. 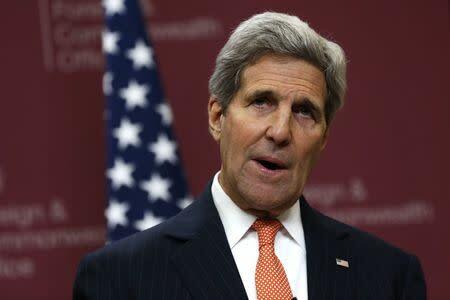 The fine was issued on Thursday after a snow-removal company hired by Kerry and his neighbors in the city's historic Beacon Hill neighborhood saw yellow tape blocking the sidewalk alongside the home and thought it was related to security for the top U.S. diplomat. The tape had been put up to warn pedestrians of falling ice and snow, said Kerry's spokesman, Glen Johnson. "Once they understood that they were allowed to enter the area, the contractors finished the sidewalk late Thursday morning," he said. Kerry was in Saudi Arabia with President Barack Obama to attend the funeral of King Abdullah and meet with his successor, King Salman, at the time of the storm. "The snow has all been shoveled now," Johnson said.